Graphic Novel Review 32/365: The Adventures of Superhero Girl – Dark Horse Week! 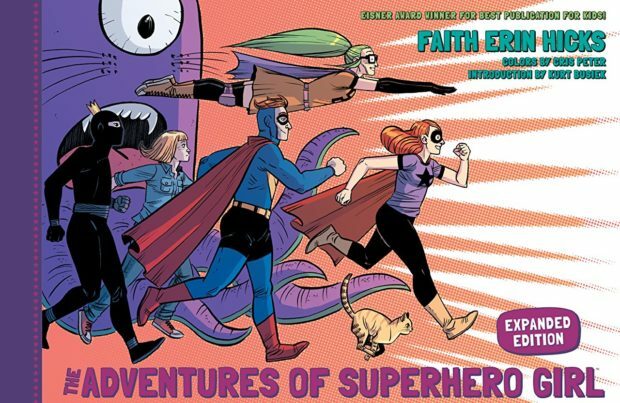 Dark Horse Week continues with Faith Erin Hicks’ The Adventures of Superhero Girl. An Eisner Award Winner for Best Publication for Kids (ages 8-12), The Adventures of Superhero Girl was originally published as shorter stories in print and on-line, now available collected in a beautiful hardcover from Dark Horse Comics. The book is physically longer than your usual graphic novel; check out the book image above. It also does a cool thing where it flips from horizontal to vertical near the end of the book, forcing the reader to turn the book while reading. I’m sure that’s just how things worked out in the publication of web comics into print, but I dig it! Made for a fun change over the 32 reviews that I’ve done so far. The Adventures of Superhero Girl is a very funny collection of stories documenting the day in the life adventures of an early 20s woman, living in the shadow of her larger than life superhero brother, while failing to make the rent payment to her more than understanding roommate. The book is comprised of short tales that blend wonderfully to give the reader a nice round picture of Superhero Girl and the world/people with whom she interacts. The art style is very reminiscent of Bryan Lee O’Malley’s. Maybe it’s just the way things get done in Canada. I’m not complaining. I love the art of this book, and the coloring by Cris Peter is also Scott Pilgrim-y fantastic! I hope Hicks and Peter do not take offence to my comparison to the Pilgrim books. I mean it as a huge compliment! For a book to tickle me as much as Pilgrim…it’s saying a lot! This book is also funny as heck! I was reading this book in my classroom after school today laughing out loud. Being hard is funny, and making me laugh at loud in a genuine way is even harder. I don’t toss out real laughs easily, but Superhero Girl gets it right. A book for younger kids that actually teaches them how to be funny in their writing is the pinnacle of spot-on. I will proudly promote this book in my classroom on my book shelf. My kids will love it! I think I teach kids a bit too old to get a class set of this book, but man, I will get kids reading it, especially the funny ones! I had a lot of fun writing this graphic novel review, cheers!